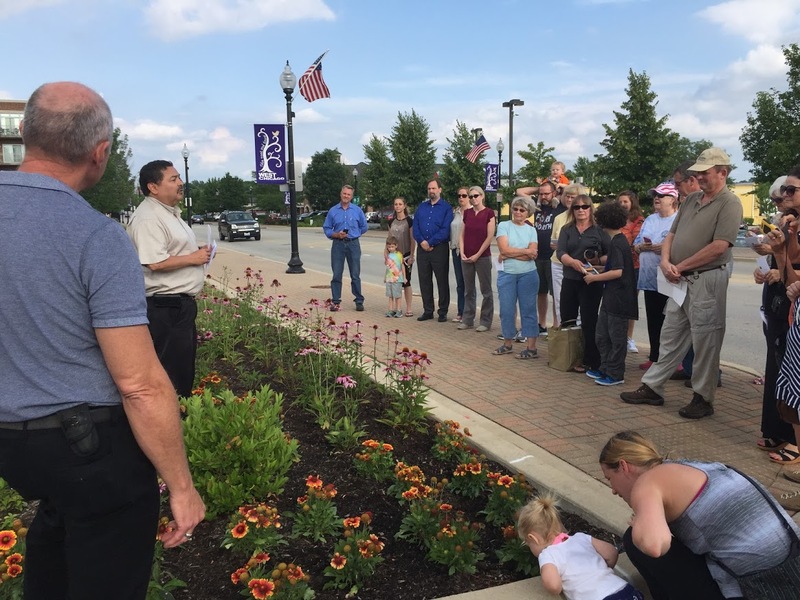 The dedication of a new Monarch Waystation at City Hall will be one of the featured projects included in West Chicago’s application to become an America in Bloom City. West Chicago, Illinois: April 12, 2018 - West Chicago’s garden and creative landscapes are about to pop thanks to the efforts of active community groups and individuals. Downtown and community-wide beautification efforts are being planned by a newly formed America in Bloom committee to complement the vibrant display of Pop Art themed street banners sponsored by the West Chicago Cultural Arts Commission which will be installed in early May. The work of nineteen local and area artists were selected to be included in the upcoming public art display which has become an annual tradition for West Chicago since 2009. This exhibit will add a compelling artistic accompaniment to the natural beauty found within downtown West Chicago’s planned flower beds and planters, and hanging baskets that have been donated by Ball Horticultural Company this year. Both groups, the America in Bloom committee and the Cultural Arts Commission, hope that their collective efforts will wow America in Bloom judges scheduled to visit West Chicago in late July, and that an official designation as an America in Bloom City will be awarded to provide the City with well-deserved national recognition for its many community-building programs. America in Bloom is a national non-profit organization dedicated to promoting nationwide beautification programs and personal and community involvement through the use of flowers, plants, trees, and other environmental and lifestyle enhancements, like public art installations and community health initiatives. The newly formed committee currently includes representation from The GardenWorks Project, Ball Horticultural Company, People Made Visible, the Forest Preserve District of DuPage, We Grow Dreams Garden Center, the West Chicago Garden Club, the Green Disciples of the First United Methodist Church, as well as the Lions, Rotary and Kiwanis Clubs of West Chicago. Several projects are being planned to engage the entire community in the citywide beautification effort, the first one scheduled for Saturday, May 12, 2018 from 8:00 a.m. – 12:00 p.m. through the Lions, Rotary and Kiwanis Clubs of West Chicago. Volunteers are needed to plant the downtown flower beds and the groups are hoping for a large turnout. The City will be supplying the plant material and a pizza lunch at noon, but volunteers are asked to bring shovels and gloves for their use. Homeowner Associations throughout the community have also been contacted and encouraged to participate, both in the downtown planting, as well as creating colorful entry landscapes and encouraging residents to plant a “pop” of color in their front yards for added neighborhood enhancement. Another community partner, Willow Creek Wheaton (Willow Wheaton Care Center), which helps those in need living in West Chicago by providing monthly donations (dates found on the City’s Community Calendar) of groceries, diapers and a children’s clothing store where all items are 50 cents, is sponsoring its annual seed-packing service opportunity for families all over the world. The group’s goal is to end the cycle of poverty by providing both food and a source of income. One person packing seeds for two hours provides food for about 60 families. The seed-packing takes place at Wheaton Academy, 900 Prince Crossing Road in West Chicago, with sessions on Saturday, April 21, 2018 from 9:00 – 11:15 a.m., 12:00 – 2:30 p.m., and 6:30 – 9:00 p.m. Also, there is one session on Sunday, April 22 from 1:15 – 3:30 p.m. For more information, contact Anne Watson at awatson@willowcreek.org. America in Bloom committee members are still needed and should contact Rosemary Mackey, the City’s Marketing and Communications Coordinator. “While the weather might make us feel otherwise, spring is guaranteed to arrive this year, and when it does, West Chicago will be blooming with community pride,” she said. West Chicago is a diverse, family-oriented community with a rich cultural mix and a proud heritage. It is the first Illinois community established by the railroads and continues to be a convenient transportation hub served by three major rail lines, Illinois' third-busiest airport and three state highways. For more information, call Rosemary Mackey, Marketing & Communications Coordinator, at (630) 293-2200 x 139.